The arena at Pula, Croatia retains its complete circuit of walls. The Pula Arena (Croatian: Pulska Arena, Italian: Arena di Pola) is the name of the amphitheatre located in Pula, Croatia. The Arena is the only remaining Roman amphitheatre to have four side towers and with all three Roman architectural orders entirely preserved. It was constructed in 27 BC – 68 AD and is among the six largest surviving Roman arenas in the World. A rare example among the 200 surviving Roman amphitheatres, it is also the best preserved ancient monument in Croatia. Restored arched walls at Pula. The amphitheatre is depicted on the reverse of the Croatian 10 kuna banknote, issued in 1993, 1995, 2001 and 2004. The exterior wall is constructed in limestone. 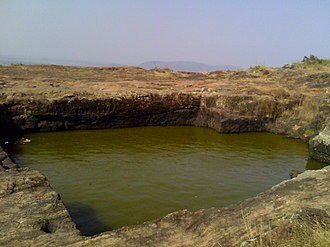 The part facing the sea consists of three stories, while the other part has only two stories since the amphitheatre was built on a slope. The maximum height of the exterior wall is 29.40 m (96.5 ft). The first two floors have each 72 arches, while the top floor consists of 64 rectangular openings. The axes of the elliptical amphitheatre are 132.45 and 105.10 m (434.5 and 344.8 ft) long, and the walls stand 32.45 m (106.5 ft) high. It could accommodate 23,000 spectators in the cavea, which had forty steps divided into two meniani. The seats rest directly on the sloping ground; The field for the games, the proper arena, measured 67.95 by 41.65 m (222.9 by 136.6 ft). The field was separated from the public by iron gates. The arena had a total of 15 gates. 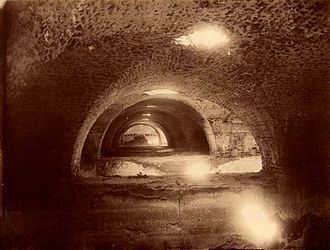 A series of underground passageways were built underneath the arena along the main axis from which animals, ludi scenes and fighters could be released; stores and shops were located under the raked seating. The amphitheatre was part of the circuit of the gladiators. 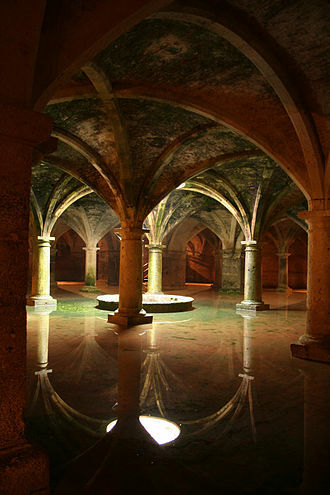 Each of the four towers had two cisterns filled with perfumed water that fed a fountain or could be sprinkled on the spectators. The amphitheatre could be covered with velaria (large sails), protecting the spectators from sun or rain (as attested by rare construction elements). This amphitheatre, through its remarkable conservation, has served as an excellent example for the study of ancient building techniques. Amphoras in the exhibition below the arena. The Arena was built between 27 BC and 68 AD, as the city of Pula became a regional centre of Roman rule, called Pietas Julia. The name was derived from the sand that, since antiquity, covered the inner space. It was built outside the town walls along the Via Flavia, the road from Pula to Aquileia and Rome. The amphitheatre was first built in timber during the reign of Augustus (2–14 AD). 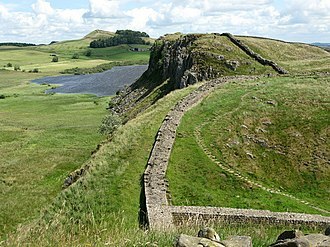 It was replaced by a small stone amphitheatre during the reign of emperor Claudius. 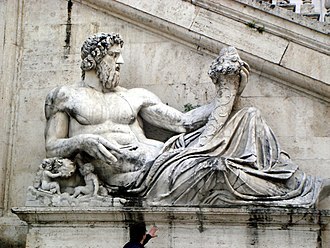 In 79 AD it was enlarged to accommodate gladiator fights by Vespasian and to be completed in 81 AD under emperor Titus. This was confirmed by the discovery of a Vespasian coin in the malting. A Hellene Christian from Byzantine Smyrna named Germanicus of Smyrna was martyred in the arena in the 4th century. The amphitheatre remained in use until the 5th century, when emperor Honorius prohibited gladiatorial combats. It was not until 681 that combat between convicts, particularly those sentenced to death, and wild animals was forbidden. In the 5th century the amphitheatre began to see its stone plundered by the local populace. By the 13th century, the patriarch of Aquileia forbade further removal from the Arena. In the Middle Ages the interior of the Arena was used for grazing, occasional tournaments by the Knights of Malta and medieval fairs. 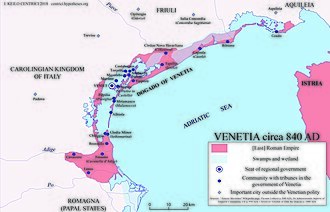 In 1583 the Venetian Senate proposed dismantling the arena and rebuilding it within Venice. The proposals were rejected. Today, a headstone celebrating the Venetian senator Gabriele Emo's opposition to the plan is currently visible on the second tower. In 1709, stone was taken from Pula arena for the belfry foundations at Pula Cathedral. This was the last time the arena was used as a source of stone. General Auguste de Marmont, as French governor of the Illyrian Provinces, started the restoration of the arena. This was continued in 1816 by the Ticinese architect Pietro Nobile, commissioned by the emperor Francis I of Austria. In 1932, the arena was adapted for theatre productions, military ceremonies and public meetings. In its present state, seating capacity is around 7000 and 12,500 for all standing events. The arena is used as a venue for many concerts. Performances have included Foo Fighters, Luciano Pavarotti, Đorđe Balašević, Plácido Domingo, Andrea Bocelli, Patrizio Buanne, Jose Carreras, Dino Merlin, Jamiroquai, Anastacia, Eros Ramazzotti, Maksim Mrvica, Norah Jones, Zucchero, Zdravko Čolić, Alanis Morissette, Sinéad O'Connor, Elton John, 2Cellos, Sting, Michael Bolton, Seal, Il Divo, Tom Jones, Gibonni, Manu Chao, Oliver Dragojević, Leonard Cohen, Grace Jones, Moderat, David Gilmour and Frank Zivkovic. 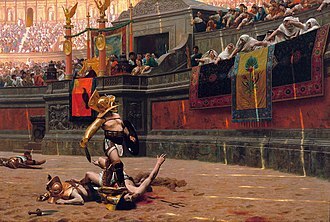 The arena has also been used for cinematic works such as Titus, a 1999 film adaptation of Shakespeare's revenge tragedy Titus Andronicus by Julie Taymor. Two professional ice hockey games were played there on September 14 and 16, 2012; KHL Medveščak, a Zagreb-based Erste Bank Eishockey Liga club, hosted HDD Olimpija Ljubljana and the Vienna Capitals. Turner, J., Grove Dictionary of Art, Oxford University Press, USA. New Ed edition, January 2, 1996. ISBN 0-19-517068-7. Mlakar, Stefan, The Amphitheatre in Pula, The Archaeological Museum of Istra, 1957. Džin, Kristina. Mirko Žužić, ed. Arena Pula. Zagreb: Viza MG d.o.o. Remetinečka cesta 81, Zagreb. ISBN 978-953-7422-15-8. ^ Croatian National Bank. Features of Kuna Banknotes Archived 2009-05-06 at the Wayback Machine. : 10 kuna Archived 2011-06-04 at the Wayback Machine. (1993 issue), 10 kuna Archived 2011-06-04 at the Wayback Machine. (1995 issue), 10 kuna Archived 2011-06-04 at the Wayback Machine. (2001 issue) & 10 kuna Archived 2011-06-04 at the Wayback Machine. (2004 issue). – Retrieved on 30 March 2009. ^ Leahy, Sean. "Here's what hockey in a Roman amphitheatre looked like (Spoiler: It was awesome)". Yahoo Sports. Retrieved 18 September 2012. Wikimedia Commons has media related to Amphitheatre (Pula). Sand is a naturally occurring granular material composed of finely divided rock and mineral particles. It is defined by size, being finer than gravel and coarser than silt, Sand can refer to a textural class of soil or soil type, i. e. a soil containing more than 85% sand-sized particles by mass. The second most common type of sand is calcium carbonate, for example aragonite, for example, it is the primary form of sand apparent in areas where reefs have dominated the ecosystem for millions of years like the Caribbean. Sand is a non renewable resource over human timescales, and sand suitable for making concrete is in high demand, in terms of particle size as used by geologists, sand particles range in diameter from 0.0625 mm to 2 mm. An individual particle in this size is termed a sand grain. Sand grains are between gravel and silt, a 1953 engineering standard published by the American Association of State Highway and Transportation Officials set the minimum sand size at 0.074 mm. A1938 specification of the United States Department of Agriculture was 0.05 mm. Sand feels gritty when rubbed between the fingers. ISO14688 grades sands as fine and coarse with ranges 0.063 mm to 0.2 mm to 0.63 mm to 2.0 mm. In the United States, sand is commonly divided into five sub-categories based on size, very fine sand, fine sand, medium sand, coarse sand, and very coarse sand. These sizes are based on the Krumbein phi scale, where size in Φ = -log2D, on this scale, for sand the value of Φ varies from −1 to +4, with the divisions between sub-categories at whole numbers. The composition of sand is highly variable, depending on the local rock sources. The gypsum sand dunes of the White Sands National Monument in New Mexico are famous for their bright, arkose is a sand or sandstone with considerable feldspar content, derived from weathering and erosion of a granitic rock outcrop. Some sands contain magnetite, glauconite or gypsum, Sands rich in magnetite are dark to black in color, as are sands derived from volcanic basalts and obsidian. Chlorite-glauconite bearing sands are typically green in color, as are sands derived from basaltic with a high olivine content, many sands, especially those found extensively in Southern Europe, have iron impurities within the quartz crystals of the sand, giving a deep yellow color. A martyr is somebody who suffers persecution and death for advocating, refusing to renounce, or refusing to advocate a belief or cause as demanded by an external party. This refusal to comply with the presented demands results in the punishment or execution of the martyr by the oppressor, originally applied only to those who suffered for their religious beliefs, the term is now often used in connection with people imprisoned or killed for espousing a political cause. Most martyrs are considered holy or are respected by their followers, becoming symbols of exceptional leadership, Martyrs play significant roles in religions. Similarly, martyrs have had effects in secular life, including specific figures such as Socrates, as well as in politics. In its original meaning, the martyr, meaning witness, was used in the secular sphere as well as in the New Testament of the Bible. The term, in this sense, entered the English language as a loanword. The death of a martyr or the value attributed to it is called martyrdom, the early Christians who first began to use the term martyr in its new sense saw Jesus as the first and greatest martyr, on account of his crucifixion. 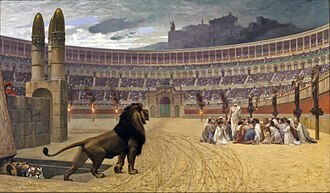 The early Christians appear to have seen Jesus as the archetypal martyr, the word martyr is used in English to describe a wide variety of people. However, the table presents a general outline of common features present in stereotypical martyrdoms. Examples of this are found in the Mahabharata, during the great war which commenced, even Arjuna was brought down with doubts, e. g. attachment, fear. This is where Krishna instructs Arjuna how to carry out his duty as a righteous warrior, Martyrdom in Judaism is one of the main examples of Kiddush Hashem, meaning sanctification of Gods name through public dedication to Jewish practice. Religious martyrdom is considered one of the significant contributions of Hellenistic Judaism to Western Civilization. Frend, Judaism was itself a religion of martyrdom and it was this Jewish psychology of martyrdom that inspired Christian martyrdom. In Christianity, a martyr, in accordance with the meaning of the original Greek martys in the New Testament, is one who brings a testimony, in particular, the testimony is that of the Christian Gospel, or more generally, the Word of God. Andrea Bocelli, OMRI, OMDSM is an Italian classical crossover tenor, recording artist, and singer-songwriter. Born with poor eyesight, Bocelli became permanently blind at the age of 12, Bocelli has recorded fifteen solo studio albums, of both pop and classical music, three greatest hits albums, and nine complete operas, selling over 80 million records worldwide. He has had success as a crossover performer bringing classical music to the top of international pop charts, in 1998, Bocelli was named one of Peoples 50 Most Beautiful People. In 1999, Bocelli was nominated for Best New Artist at the Grammy Awards, the Prayer, his duet with Celine Dion for the animated film Quest for Camelot, won the Golden Globe for Best Original Song and was nominated for an Academy Award in the same category. Seven of his albums have reached the top 10 on the Billboard 200. The single went on to sell twelve million copies worldwide. Bocelli was born to Alessandro and Edi Bocelli, doctors had advised Bocellis parents to abort Bocelli before birth as they predicted, based on studies, that Bocelli would be born with a disability. The Bocellis declined and gave birth to Andrea and it was evident at birth that Bocelli had numerous problems with his sight, and after visits to many doctors, he was diagnosed with congenital glaucoma. Bocelli has stated that his mothers decision to give birth to him and overrule the doctors advice was the inspiration for him to hold a pro-life view towards abortion. Bocelli grew up on his familys farm, where they sold farm machinery and made wine in the village of La Sterza. Bocellis mother and younger brother Alberto still live in the family home, as a young boy, Bocelli showed a great passion for music. His mother has said music was the only thing that would comfort him. At the age of 6, Bocelli started piano lessons, and later, learned to play the flute, trumpet, trombone and drums. 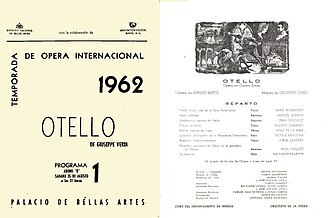 Then, when his nanny, gave him the first record of Franco Corelli, Bocelli began to show interest in pursuing the career of a tenor, by seven, he was able to recognize the famous voices of the time and tried to emulate the great interpreters. Foo Fighters is an American rock band, formed in Seattle, Washington in 1994. It was founded by Nirvana drummer Dave Grohl as a project following the dissolution of Nirvana after the death of Kurt Cobain. The group got its name from the UFOs and various phenomena that were reported by Allied aircraft pilots in World War II. 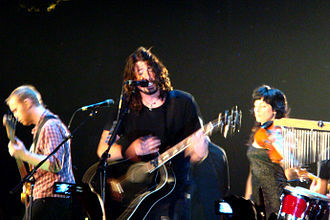 The band began with performances in Portland, Goldsmith quit during the recording of the groups second album, The Colour and the Shape, when most of the drum parts were re-recorded by Grohl himself. 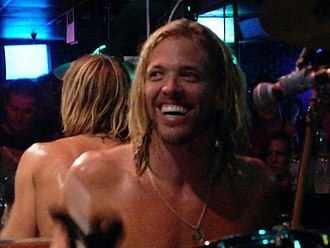 Smears departure followed soon afterward, though he would rejoin them in 2005 and they were replaced by Taylor Hawkins and Franz Stahl, although Stahl was fired before the recording of the groups third album, There Is Nothing Left to Lose. The band briefly continued as a trio until Chris Shiflett joined as the lead guitarist after the completion of There Is Nothing Left to Lose. The band released its album, One by One, in 2002. The group followed that release with the two-disc In Your Honor, Foo Fighters released its sixth album, Silence, Patience & Grace, in 2007. 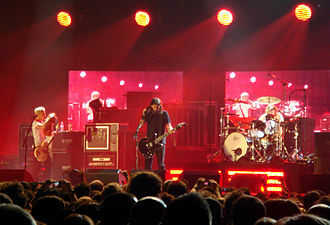 The bands seventh album, Wasting Light, produced by Butch Vig was released in 2011. In November 2014, the eighth studio album, Sonic Highways, was released as an accompanying soundtrack to the Grohl-directed 2014 miniseries of the same name. Over the course of the career, four of its albums have won Grammy Awards for Best Rock Album. As of 2015, the eight albums have sold 12 million copies in the U. S. and 30 million worldwide. Foo Fighters frontman Dave Grohl joined the grunge group Nirvana as its drummer in 1990, during tours, he took a guitar with him and wrote songs. Grohl held back these songs from the rest of the band, he said in 1997, I was in awe of, I thought it was best that I kept my songs to myself. Grohl occasionally booked studio time to record demos and covers of songs he liked, frontman Kurt Cobain was found dead in his Seattle home on April 8,1994, and Nirvana subsequently disbanded. Grohl received offers to work with artists, press rumors indicated he might be joining Pearl Jam and he almost accepted a permanent position as drummer in Tom Petty. The Iron Gates is a gorge on the Danube River. It forms part of the boundary between Serbia and Romania, the gorge lies between Romania to the north and Serbia to the south. At this point, the river separates the southern Carpathian Mountains from the foothills of the Balkan Mountains. The Romanian side of the gorge constitutes the Iron Gates natural park, in English, the gorge is known as Iron Gates or Iron Gate. An 1853 article about the Danube in The Times of London referred to it as the Iron Gate, or the Gate of Trajan. 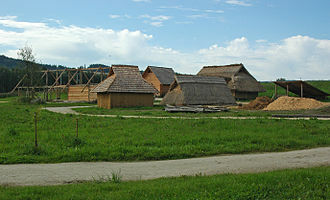 In languages of the region including Romanian, Polish, Czech and Bulgarian and these names are Romanian, Porțile de Fier. An alternative Romanian name for the last part of the route is Defileul Dunării, in Serbian, the gorge is known as Đerdap, with the last part named Đerdapska klisura from the Byzantine Greek Κλεισούρα, enclosure or pass. The first narrowing of the Danube lies beyond the Romanian isle of Moldova Veche and is known as the Golubac gorge and it is 14.5 km long and 230 m wide at the narrowest point. 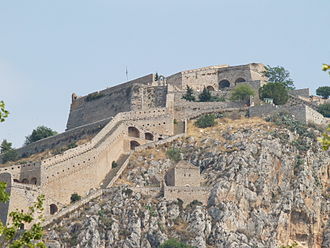 At its head, there is a fort at Golubac. Through the valley of Ljupovska lies the second gorge, Gospodjin Vir, the cliffs scale to 500 m and are the most difficult to reach here from land. The broader Donji Milanovac forms the connection with the Great and the Small Kazan gorge, the Orșova valley is the last broad section before the river reaches the plains of Wallachia at the last gorge, the Sip gorge. The Great Kazan is the most famous and the most narrow gorge of the whole route, east of this site the Roman emperor Trajan had built the legendary bridge erected by Apollodorus of Damascus. Construction of the bridge ran from 103 through 105, preceding Trajans final conquest of Dacia, on the right bank a Roman plaque commemorates him. On the Romanian bank, at the Small Kazan, the likeness of Trajans Dacian opponent Decebalus was carved in rock from 1994 through 2004, the sandstone statues dated to the early neolithic era are particularly splendid. Together with many other findings in the Iron Gates gorges area, the riverbed rocks and the associated rapids made the gorge valley an infamous passage for shipping. 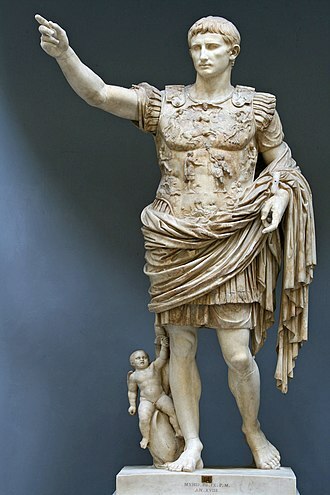 Honorius was Western Roman Emperor from 393 to 423. He was the son of emperor Theodosius I and his first wife Aelia Flaccilla, and brother of Arcadius. Even by the standards of the rapidly declining Western Empire, Honoriuss reign was precarious and his reign was supported by his principal general, who was successively Honoriuss guardian and his father-in-law. 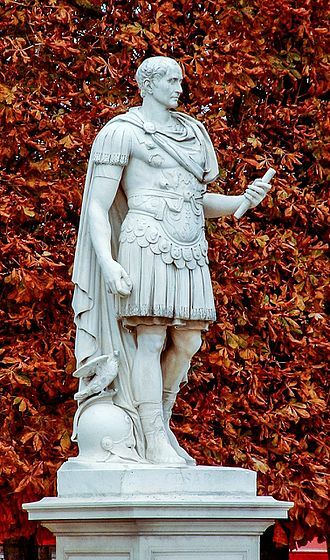 Stilichos generalship helped preserve some level of stability, but with his execution in 408, Honorius is widely considered as one of the worst of the emperors, it was during his reign that Rome was sacked for the first time in 800 years. When Theodosius died, in January 395, Honorius and Arcadius divided the Empire, during the first part of his reign Honorius depended on the military leadership of the general Stilicho, who had been appointed by Theodosius and was of mixed Vandal and Roman ancestry. To strengthen his bonds with the emperor, Stilicho married his daughter Maria to him. The epithalamion written for the occasion by Stilichos court poet Claudian survives, Honorius was greatly influenced by the Popes of Rome, who sought to extend their influence through his youth and weak character. 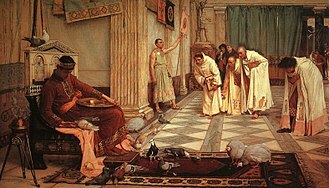 So it was that Pope Innocent I contrived to have Honorius write to his brother, while the new capital was easier to defend, it was poorly situated to allow Roman forces to protect central Italy from the increasingly regular threat of barbarian incursions. 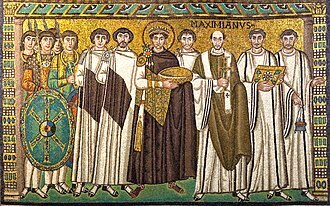 It was significant that the Emperors residence remained in Ravenna until the overthrow of the last western Roman Emperor in 476. That was probably the reason why Ravenna was chosen not only as the capital of the Ostrogothic Kingdom in Italy, Honorius reign was plagued by almost constant barbarian incursions into Gaul and Hispania. At the same time, a host of usurpers rose up due to the apparent inability of the Emperor to see to the Empires defences. 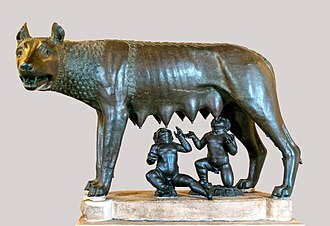 The first crisis faced by Honorius was a led by Gildo, the Comes Africae and Magister utriusque militiae per Africam, in Northern Africa. It was eventually subdued by Stilicho, under the command of Mascezel. The next crisis was the Visigoth invasion of Italy in 402 under the command of their king. 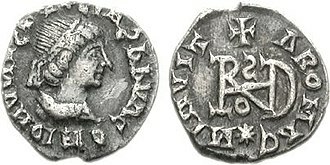 A Roman imperial coin of Marcus Claudius Tacitus, who ruled briefly from 275 to 276, follows the convention of obverse and reverse coin traditions. Solidus of Justinian II after 705. Christ is on the obverse (left), the emperor on the reverse. Silver rupee using Mughal conventions, but minted by the British East India Company Madras Presidency between 1817 and 1835. On rupees, the side that carries the name of the ruler is considered the obverse. Part of the Zliten mosaic from Libya (Leptis Magna), about 2nd century AD. It shows (left to right) a thraex fighting a murmillo, a hoplomachus standing with another murmillo (who is signaling his defeat to the referee), and one of a matched pair. A retiarius stabs at a secutor with his trident in this mosaic from the villa at Nennig, Germany, c. 2nd–3rd century AD. Sand dunes in the Idehan Ubari, Libya. Close-up (1×1 cm) of sand from the Gobi Desert, Mongolia. Sand from Coral Pink Sand Dunes State Park, Utah. These are grains of quartz with a hematite coating providing the orange color. 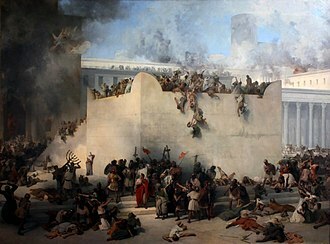 Destruction of the Temple of Jerusalem, Francesco Hayez, oil on canvas, 1867. Depicting the destruction and looting of the Second Temple by the Roman army. A mesh bag full of live frogs waiting for a buyer at Chiang Mai's Thanin market. Frog meat in Thailand is mostly used in stir-fries and Thai curries. 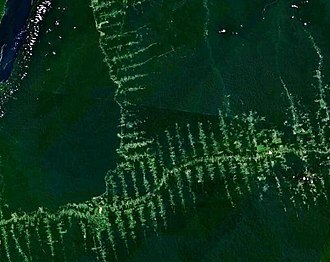 Deforestation and increased road-building in the Amazon Rainforest are a significant concern because of increased human encroachment upon wild areas, increased resource extraction and further threats to biodiversity. Francis I as Austrian Emperor, undated, Salzburg Museum. 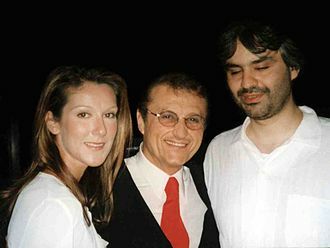 Bocelli with Celine Dion and Tony Renis in 2002. Bocelli with his then fiancée Veronica Berti in Tokyo, Japan, during his 2008 Asian Tour. David Foster speaks at the ceremony honoring Bocelli with his star. The Amphitheatre of Pompeii, one of the earliest known Roman amphitheatres, in the 1800s.